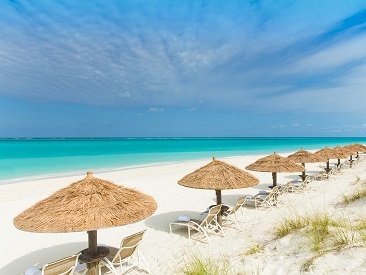 The Sands at Grace Bay is a European plan, family-friendly resort on a secluded stretch of the sugar-white sands of Grace Bay Beach Turks and Caicos. Oversized balconies complement large, graceful suites and offer space for quiet daydreaming, fine dining and family play. This is the perfect combination of seclusion and sophistication, perfect for those seeking an intimate, relaxing escape. 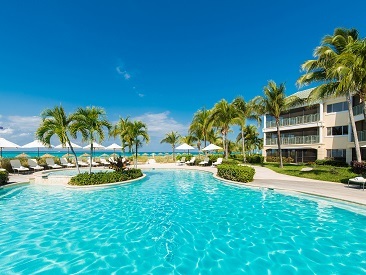 An earthly wonder of sand and sea meet at the family friendly The Sands at Grace Bay Beach, a 116 suite luxury resort nestled on the sugar white sands of the world famous Grace Bay Beach. Oversized balconies complement large, graceful suites and offer space for quiet daydreaming, fine dining and family play. This is the perfect combination of seclusion and sophistication. Children ages 2-12 stay free with parents. Maximum four children free in two-bedroom units or six children free in three-bedroom units (using existing bedding). - Received TripAdvisor's 2013 "Certificate of Excellence" Award for consistently achieving outstanding traveler reviews. - Named one of the "Top 30 Hotels in the Caribbean & the Atlantic" by Condé Nast Traveler's 2012 Readers' Choice Awards. The Sands at Grace Bay has completed its $4.5 million renovation, which includes an array of redesigned spaces and new accents. Among them are a gracious new open-air lobby with polished mahogany, sweeping paddle fans and comfortably overstuffed chairs, as well as elegantly redesigned suites. Each suite has been refinished with ample travertine baths, stainless kitchen appliances and granite countertops, sumptuous bedding and other soft goods. In addition to the above enhancements, the resort's Hemingway's Beachfront Restaurant has added a retractable awning, offering guests additional shade from the sun and a more enjoyable open-air dining experience. A newly installed theater in the resort's main swimming pool will keep guests warm during the cooler months, and the resort has installed an environmentally friendly Bionest wastewater treatment system to irrigate the resort grounds and gardens.The resort has also added stand-up paddleboards to its complimentary amenities.